Closer to Heaven: Doug & Gerry, 2012. Closer to Heaven: Doug, Gerry, & Mother, 2012. Closer to Heaven: Doug, Gerry, & Vernon, 2012. Closer to Heaven: Doug, & Gerry. & Pop, 2012. Closer to Heaven: John, Peter, Cliff, Gerry, & Douglas, 2012. Closer to Heaven: Doug & Jerry 1933, 2012. 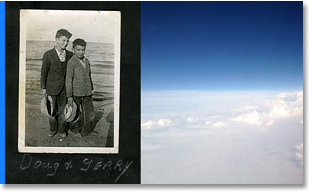 Closer to Heaven: Doug & Gerry 1934, 2012. Closer to Heaven: Doug & Jerry, 2012. When I started to make a series about my Dad—Gerry—I noticed that in all his childhood pictures he was accompanied by his older brother – Doug. What I saw was a relationship between two brothers that tied them together from birth. This bond lasted a lifetime. So much so that they passed away a week apart: first my Uncle, followed by my Dad. When my Dad passed away, the ground beneath my feet disappeared. I found myself flying to an artist talk a week later. Looking out the window of the plane, I felt I was flying closer to heaven, searching for my father and uncle. I was compelled to take pictures of what I saw at the time. Closer to Heaven. 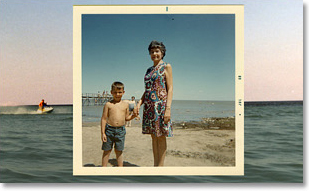 These photographs depict my father’s life in the heart of Manitoba. They show his formative years as a Métis, and the many changes that informed Aboriginal life in this period. This was a time when our family was trying to pass and fit into the mainstream culture. Photographs of Lake Winnipeg are especially revealing. It is an area important to our family, my father’s ancestral homeland, and one based on cottage culture. 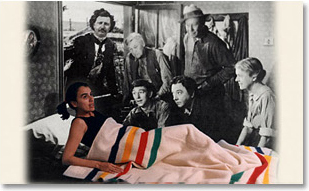 This mixing of cultures has always been a reality for the Métis. We both belong and are outsiders. As a result, family becomes a source of strength and inspiration. It remains the one constant in my work as an Aboriginal artist.